At the threshold of a new century, Eben Ezer continues to meet changing needs while remaining committed to its mission of Christian care. Today, the long-term nursing section is no longer the largest group of people served. Eben Ezer is a multi-level care facility providing service for needs ranging from fully independent living to intensive nursing care. In addition the center provides federally subsidized low rent senior housing, Lifeline, medication dispensing machines, and in-home services. Among programs that lend uniqueness to the care provided at Eben Ezer are physical, occupational, and speech therapy. Led by therapists contracted from Infinity Rehab, the therapy programs assure participants life at their highest level of functional ability. There is also the activity department that has general programs as well as activity leaders for each neighborhood who plan activities according to specific resident needs. 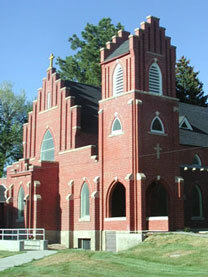 All Saints Church occupies the center of the Eben Ezer complex both physically and spiritually. Concern for the total person, spirit as well as body, has been a core difference between similar facilities and Eben Ezer since its inception. Spiritual care is ensured by the work of Chaplaincy, which provides spiritual programming, individual pastoral care for residents and a liaison between resident and home congregation. In response to the needs of people who now enter long term care closer to the end of life, the Eben Ezer Auxiliary, together with staff and resident family donations, funded the creation of a room for end-of-life care. Since the completion of "Pilgrim's Rest" in 2000, the room has been in constant use. Further, a second room for end-of-life care was furnished in 2002 by a grateful family, whose loved one had occupied the first "Pilgrim's Rest." The leadership of Eben Ezer Lutheran Care Center envisions an expansion of services through development of land west of the campus. A new vision is being explored, one of a multi-use building housing the larger communities needs and services. Needs for specialized types of housing for the elderly or families caring for an elderly member are being explored for inclusion in the possible development. In an industry dominated by large corporations, Eben Ezer continues to stand alone as an independent not-for-profit corporation maintaining affiliation only with the Rocky Mountain Synod of the Evangelical Lutheran Church in America. Its Christ-centered mission is more important than ever in making a statement about what health care for the elderly should be. Pastor Larson, past administrator of Eben Ezer, echoed the words of Pastor Jens Madsen, who firmly believed that his vision had been made a reality by the grace of God and by the support of loyal workers and volunteers. Larson wrote in Phoebe, "This spiritual foundation is what sets the ministry of Eben Ezer Lutheran Care Center apart from the other long term continuous care communities. We believe that those who serve here, as employees and volunteers, do so because God has called them to this service" (Fall, 2001). In recognizing one hundred years of ministry in the year 2003, Pastor Don Thurn, Chaplain, chaired Eben Ezer's Centennial Celebration. In December 2002, the celebration began with the dedication and display off a quilt recording the events of a century of ministry. An opening worship for the centennial was incorporated into the traditional Christmas Service of Lights in All Saints Church.